hiking | Paul's Voyage of Discovery & Etc. The Reasonably Fit, Slightly Overweight, Middle-Aged Guide to the Outdoors. My wife and I are reasonably fit, slightly overweight, middle-aged hikers who cherish our adventures in the great outdoors – and our visit to Glacier National Park in Montana was a highlight in our hiking history. The trail to Sperry Chalet rises 3,360 feet over slightly more than six miles from the Sperry Trailhead, located across the road from the Lake McDonald Lodge. The guidebooks call this hike “strenuous” – but, despite the July heat, the bugs, and the challenging elevation, we call it doable: provided you take your time, bring plenty of water, and start off early in the morning to beat the heat. Sperry Trail hikers will be rewarded for their climb to the chalet by fast-flowing mountain streams, a variety of dramatic waterfalls, magnificent trees, verdant foliage, carpets of wildflowers and air that’s as fresh as it gets. 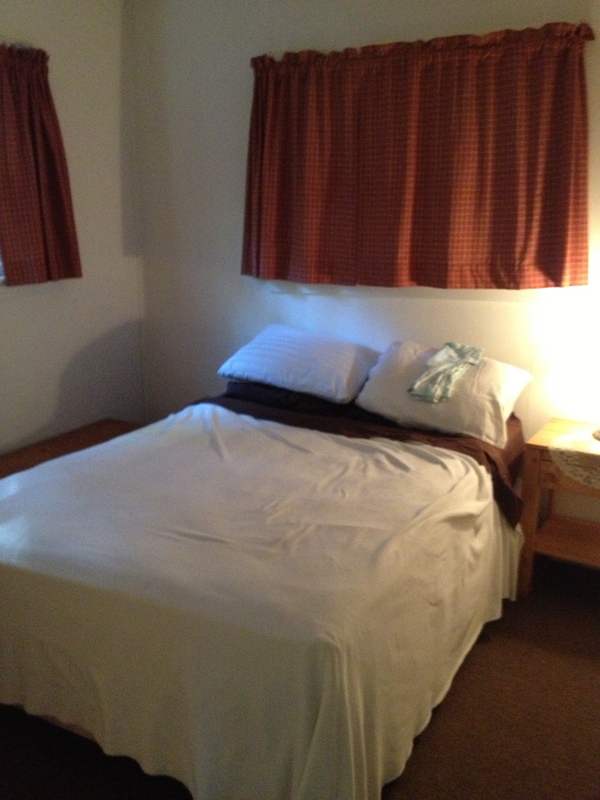 When you reach your destination, Sperry Chalet does not disappoint. It was originally built by the Great Northern Railway in 1913, and is now listed as a Historic Landmark. Many visitors to the chalet push on the nearby Sperry Glacier – but we opted to hang out at the chalet, enjoy the homey dining room, and take in the dramatic views. The Sperry Trail was built in 1902 and 1903 by college boys from Minnesota, and was likely the first organized trail-building effort in the park. These two reasonably fit, slightly overweight middle-aged hikers wish to thank those industrious, visionary college boys. 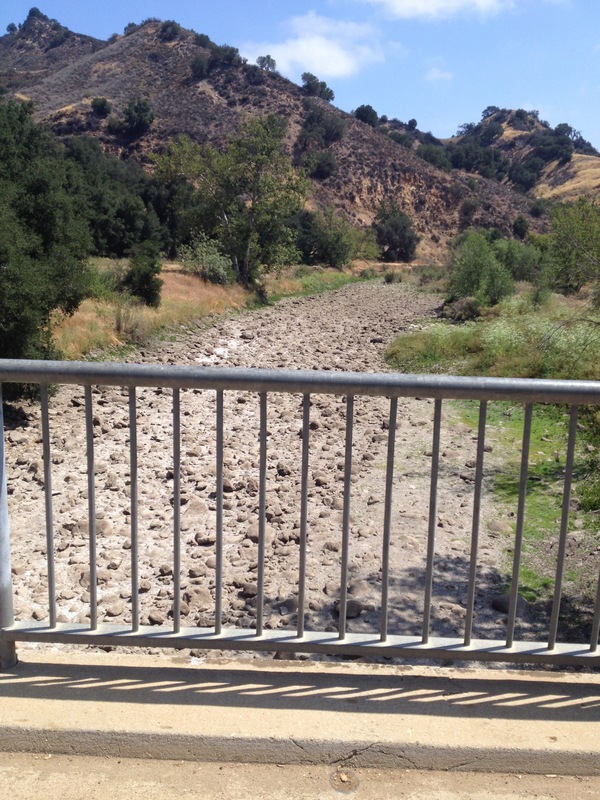 For those who might be wondering if the talk of a drought in Southern California is overblown, I submit these photos of Mailbu Creek State Park in the Santa Monica Mountains near my home in Woodland Hills. 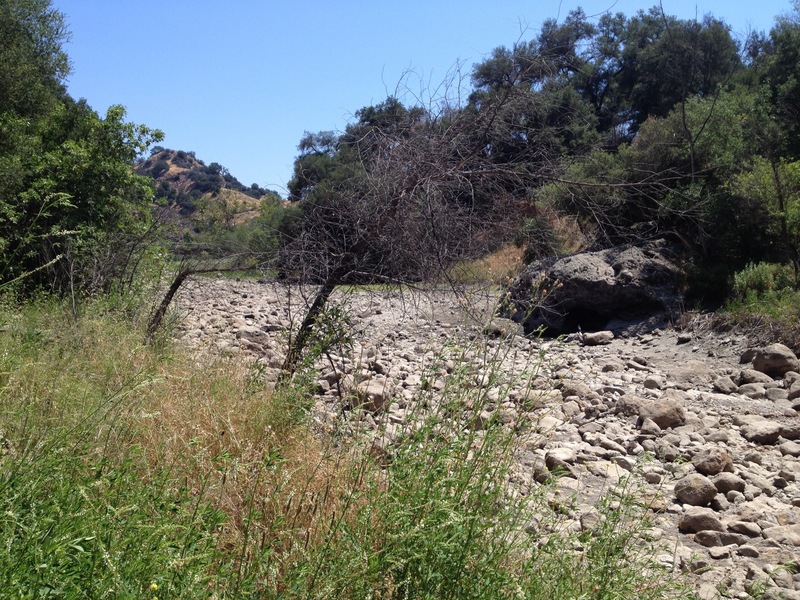 Malibu Creek State Park is named, of course, after the rather large creek that flows through it. Or, rather, that used to flow through it. At this moment, there is NO Malibu Creek. 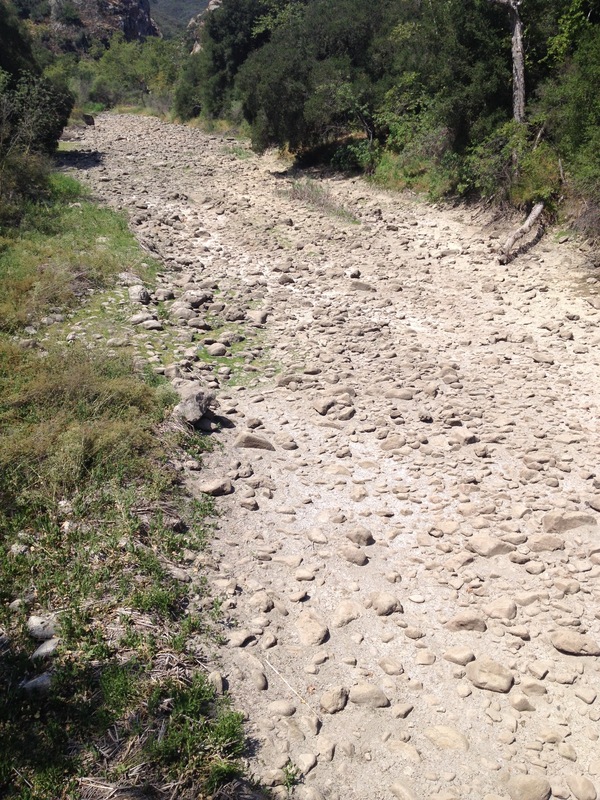 I have seen the creek bed at low water in previous years – when the stream was reduced to a few feet across during the hottest days of late summer. But I have never beheld this parched, arid landscape — especially just a few months removed from Spring. For reference – check out this footage I shot this January, showing winter rainwater pouring down into Malibu Creek from the mountains above, churning up foam as it falls. I don’t know what’s going to happen with this drought. 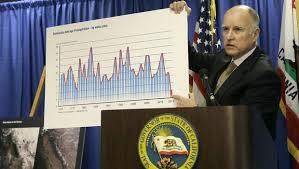 I applaud Governor Brown for getting serious about it. 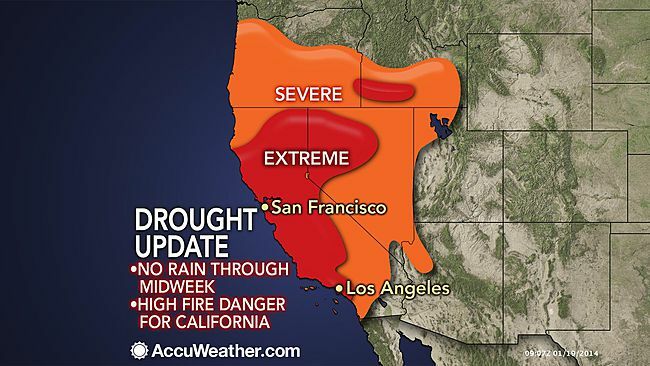 Perhaps, as my very creative wife suggests, we Southern Californians should get together for a big rain dance. 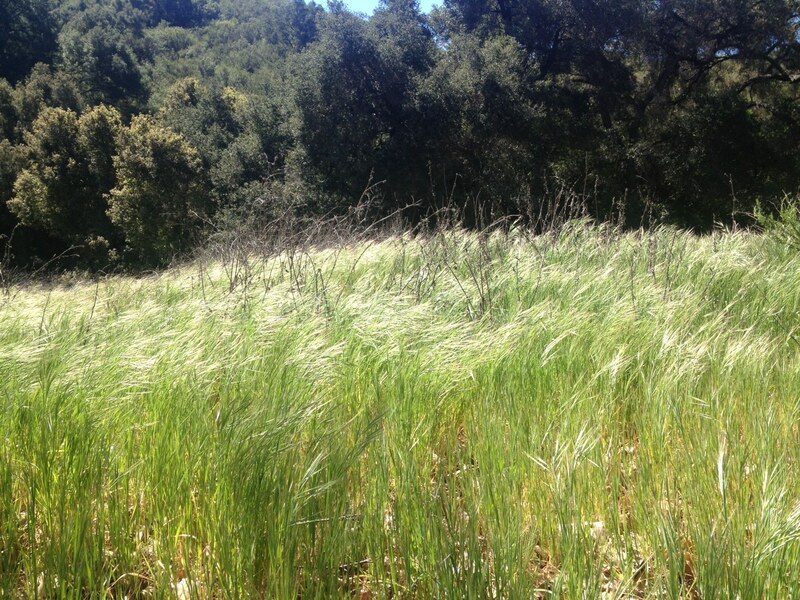 We could hold our Grand Rain Dance in Malibu Creek State Park. We could dance right in the creek. And nobody’s shoes would get wet. I’ve said it in this space before, but one of the great advantages of life in Southern California – and there are many – is the opportunity to embark on a myriad variety of grand adventures within an hour or two of your home. From where we live in Woodland Hills, nestled in the southwest edge of the San Fernando Valley, my wife and I can arrive on a Pacific Ocean beach within 20 minutes, begin an ascent into the Santa Monica Mountains in less than 15 minutes, visit the high desert in a half-hour – and drive less than an hour into a world as rough-hewn and glorious as Big Santa Anita Canyon in the San Gabriel Mountains. It’s hard to imagine that Victoria and I have lived in Southern California since 1991 and it took us 22 years to discover Big Santa Anita Canyon. 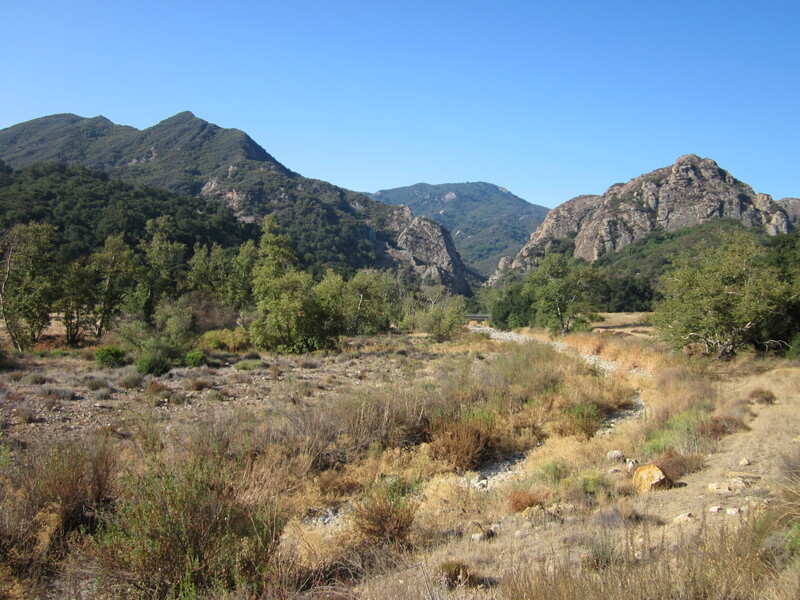 We’ve often hiked Malibu Creek State Park, Topanga State Park and many of the wonderful trails winding through the valleys and along the crest of the Santa Monica Mountains. But it wasn’t until the summer of 2013 that we trekked eastward above the town of Arcadia into the fascinating valley at the foot of Mt. 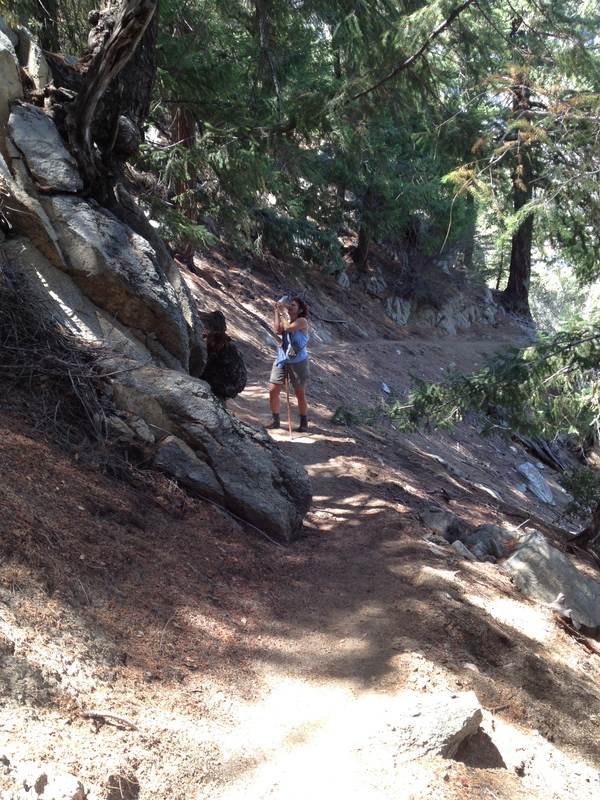 Wilson, below Chantry Flat in the San Gabriels. Victoria at the trailhead, ready for adventure. 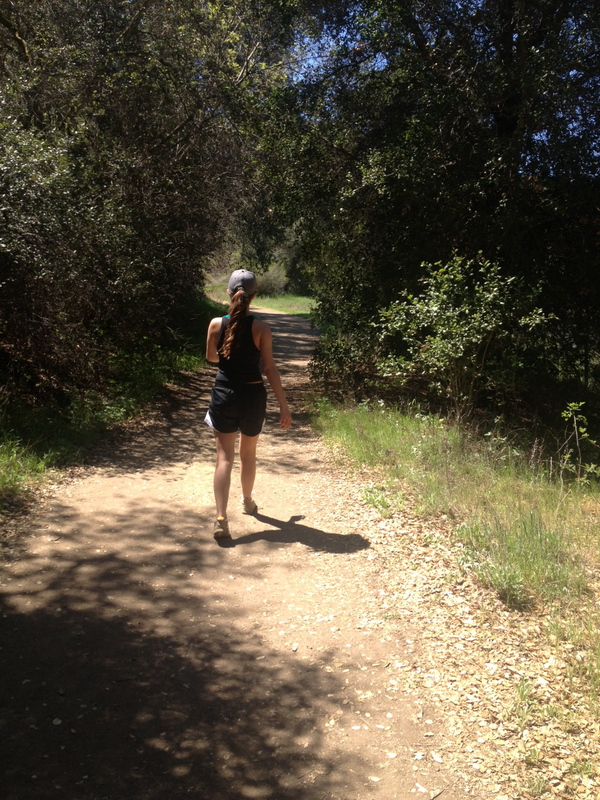 Victoria and I first descended into Big Santa Anita Canyon on a day hike. And it’s a steep descent. 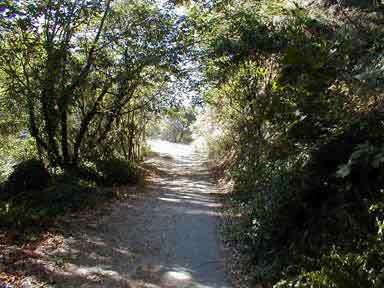 The walk down from the Chantry Flat trailhead to the valley floor begins at the parking lot and plunges 400 feet over 8 tenths of a mile. As relaxing as it is to start a hike with a long downhill stroll, veteran hikers know it only means a tortuous uphill slog on the finish. Once on the valley floor, we followed the wide, shady trail along Santa Anita Creek leading to the popular 50-foot Sturtevant Falls. We hiked about 7 miles that day, enjoying the canyon’s unique, rocky, riparian landscape and the midsummer trickle that dripped down the otherwise impressive Sturtevant Falls. 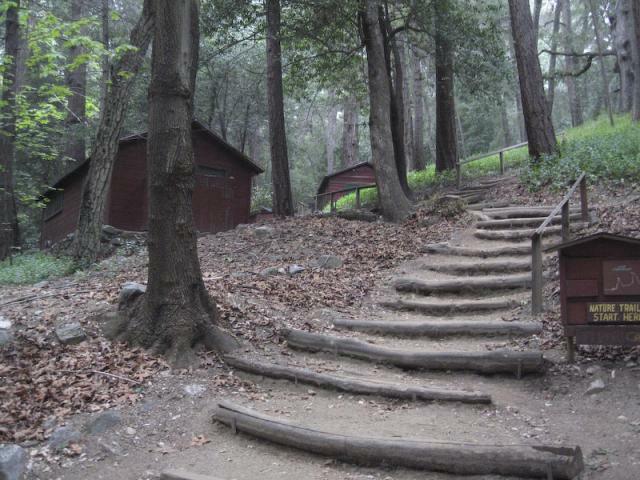 After surviving that last, brutally hot, 8th of a mile, uphill endurance test to climb back to the trailhead — Victoria and I decided to return as soon as possible for an overnight stay at valley’s historic Sturtevant’s Camp. 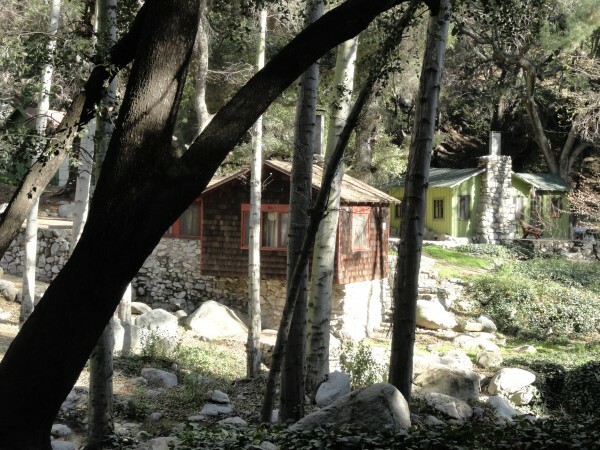 Sturtevant’s Camp is the oldest resort in the San Gabriel Mountains, built in 1892 by Wilbur M. Sturtevant during the “Great Hiking Era”(1880’s through the early 1930’s) when thousands of tourists hiked into the local mountains, covering long distances over crude trails to encounter the natural beauty of their Southern California home. 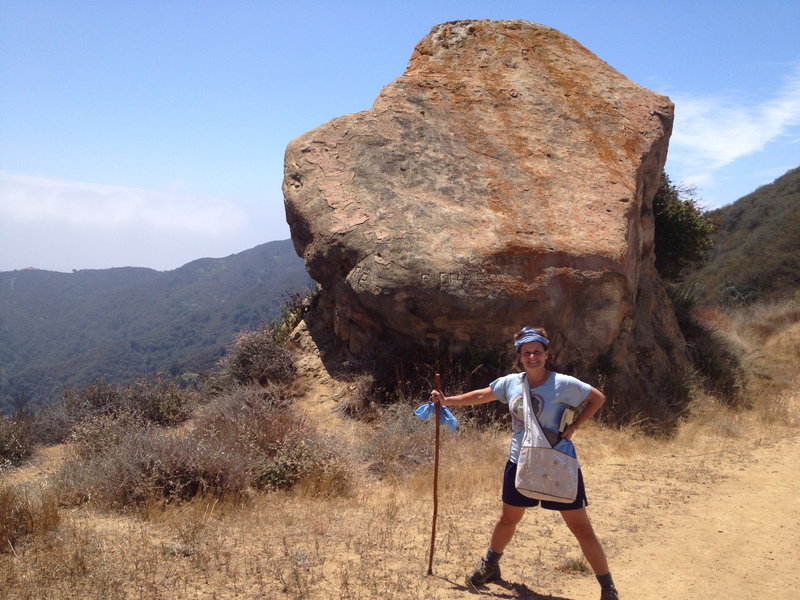 Today, it’s hard to imagine many So Cal families abandoning their SUVs, highways and fast food stops to hike with a pack mule train along the strenuous 4.5 mile trail from Chantry Flat to Sturtevant’s Camp, climbing about 1,800 feet along the way. But it was a challenge Victoria and I eagerly embraced. Incredibly, those pack mule trains still operate today. 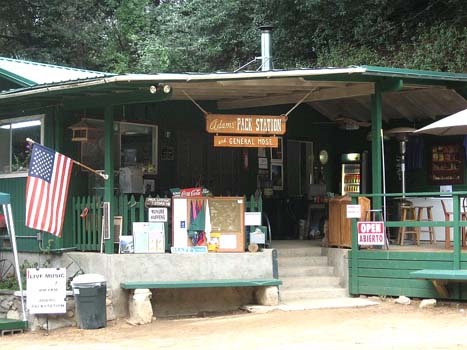 One of the coolest things about Chantry Flat is that it’s home to the last pack station in Southern California: the last operation where they actually use pack mules to haul supplies into the valley. Alas, Vic and I were too late to use the mule team service, so we had to carry two day’s worth of supplies on our own backs. 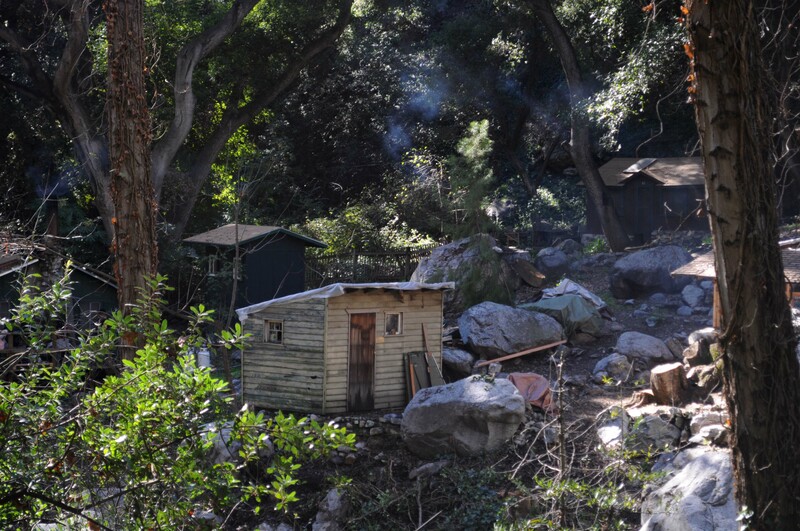 On our return visit to Big Santa Anita we blew off another look at Sturtevant Falls. After all, it hadn’t rained during the intervening two weeks. 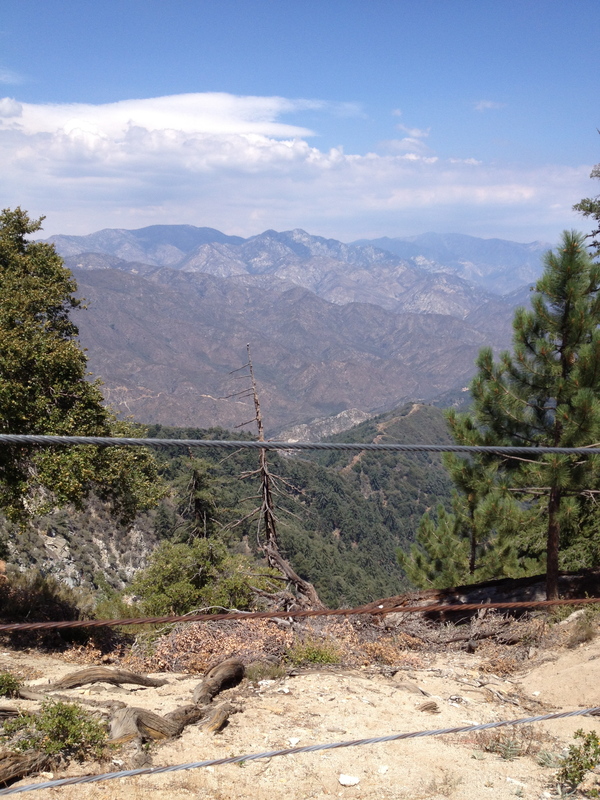 Instead, we took the trail leading up the valley to Sturtevant’s Camp. This trail wound along the rising cliffs above Sturtevant Falls, providing us with a new perspective on the falls — and some dramatic photo ops. 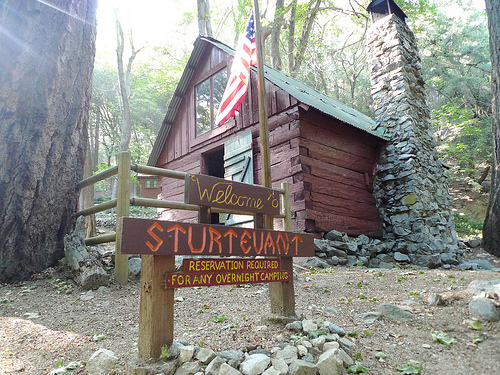 We made good time climbing up the trail and arrived at Sturtevant’s Camp much earlier than we expected — and too early to rendezvous with our camp host. We needed our host. He was the guy who would open our cabin and turn the gas on. Without him, all we could do was peek in our cabin window and look around at the dowdy yet charming remains of what was once considered a resort destination. 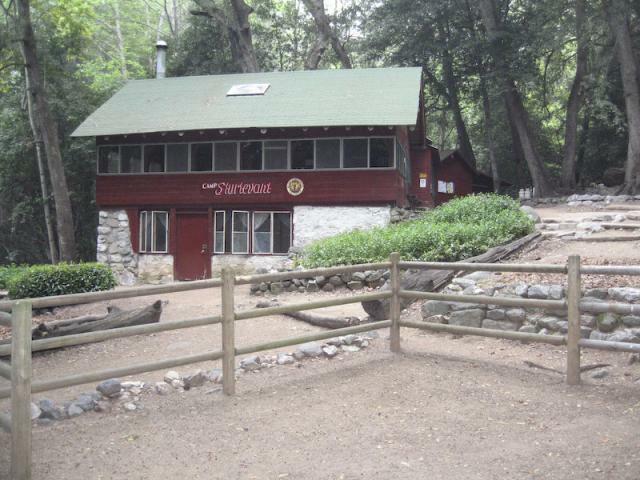 There was a time when Sturtevant’s Camp one of five resorts in the canyon back in the 1930s. That’s not the case today. Now, it’s the only “resort” left – and its chief characteristics are a rundown, historic appeal and a basic utility. It’s a comfortable and clean enough place to rest your head (and feet) after a hard day of hiking. But there was no rest for us yet. An enthusiastic (and annoyingly unexhausted) group of 20-somethings arrived at the camp: a matched set of three boys and three girls. We were pleased to know that we wouldn’t be alone at the camp – but we weren’t ready to get social yet. And since our camp host had yet to arrive, we made a bold decision: to climb 5,710-foot Mt. Wilson. Since the camp sits at about 3,500 feet above sea level, our ascent of Mt. 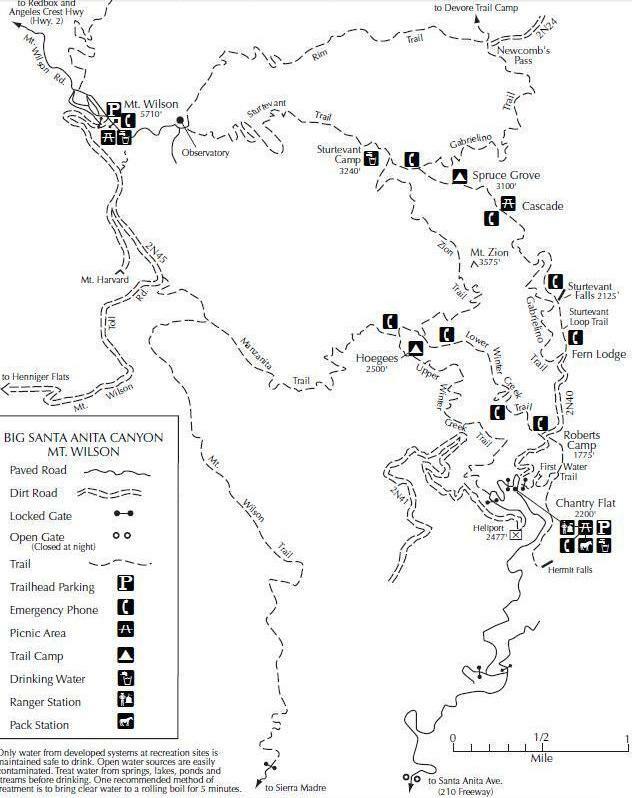 Wilson covered three miles and 2,200 feet of elevation. That’s a lot of “up”. It’s a good thing that Victoria and I had been hiking regularly for several months before we attempted the summit of Mt. Wilson. And thank goodness we brought just enough water. The late afternoon sun was merciless, and there were several treeless stretches with little or no cover along the winding, narrow, rocky, dusty trail up to the famous observatory. Even before we gained the summit our hard work was well rewarded by stunning views of the L.A. basin spreading out before us to the south. It was a clear day – and even Catalina Island was in view. Okay, so you can’t see Catalina. Blame my damn iPhone camera! At the summit, we still weren’t finished hiking. 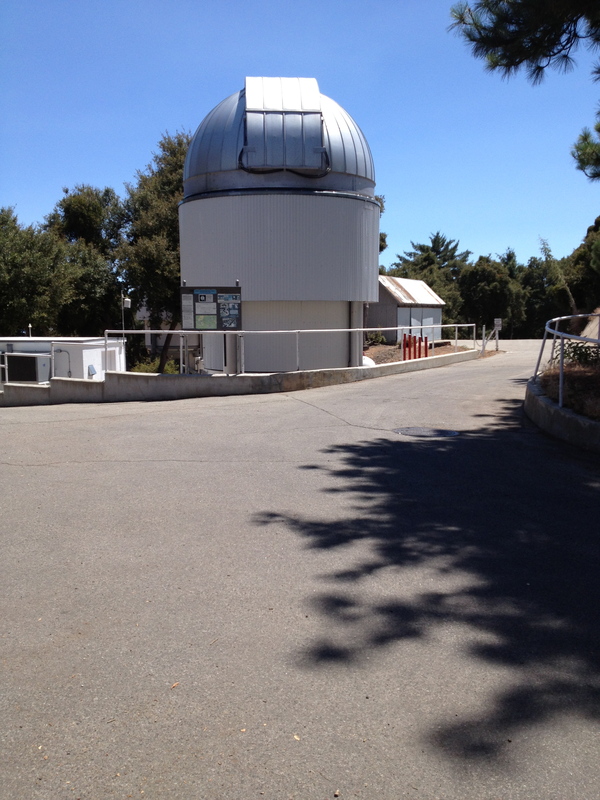 The concrete roads wound past the white domes of the observatory and a series of other telescopes. 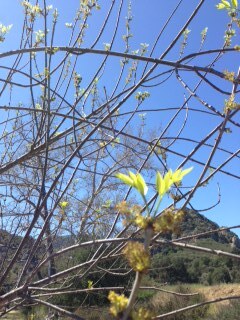 Finally, we arrived at the Cosmic Café, which is open from April to October. The Cosmic Café is not fine dining, but we were happy to indulge in a hot dog, Diet Coke and more water as we rested before our descent back to the camp. When we got back to the camp our host was waiting for us. 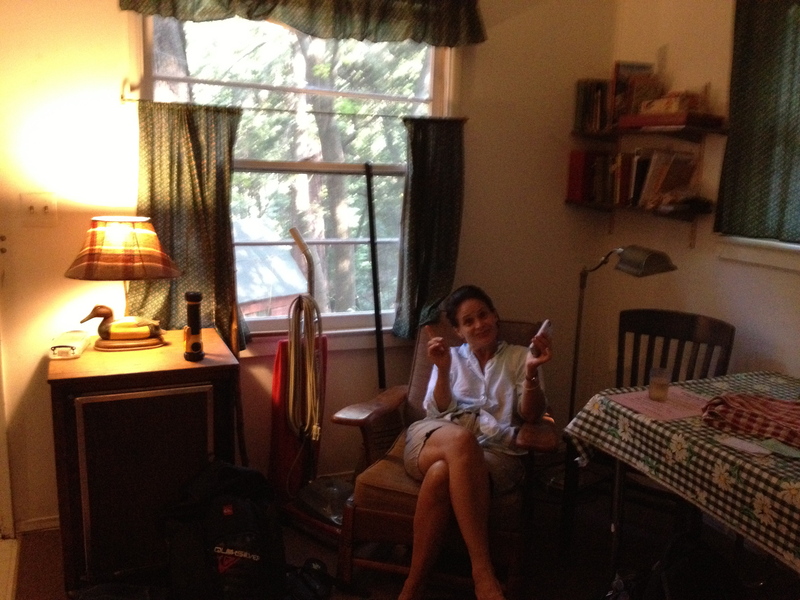 He opened our cabin – and, exhausted but feeling victorious, we moved in for a rustic but comfortable night’s stay. 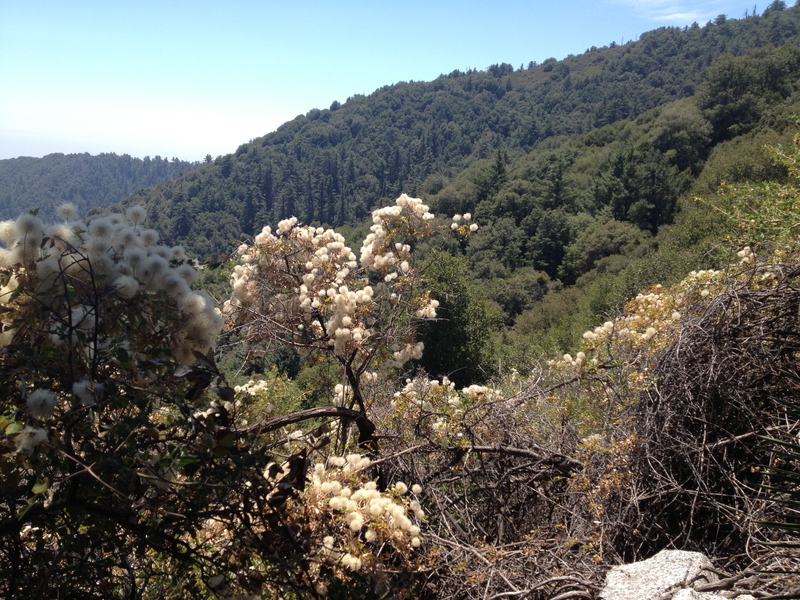 The next day, we’d be hiking for another 7 rugged miles on our way back to Chantry Flat. 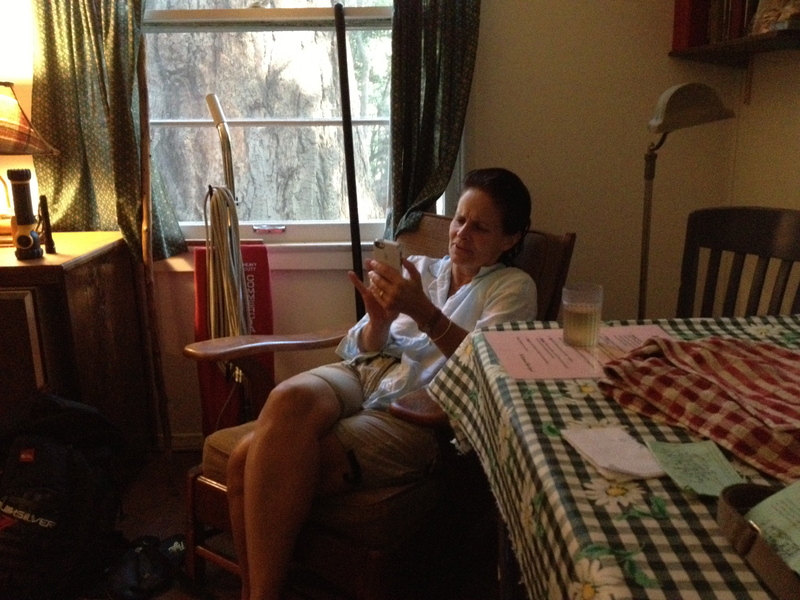 But first, it was a delightful evening of sipping Chardonnay and enjoying the quaint, spare luxuries of Sturtevant’s Camp. 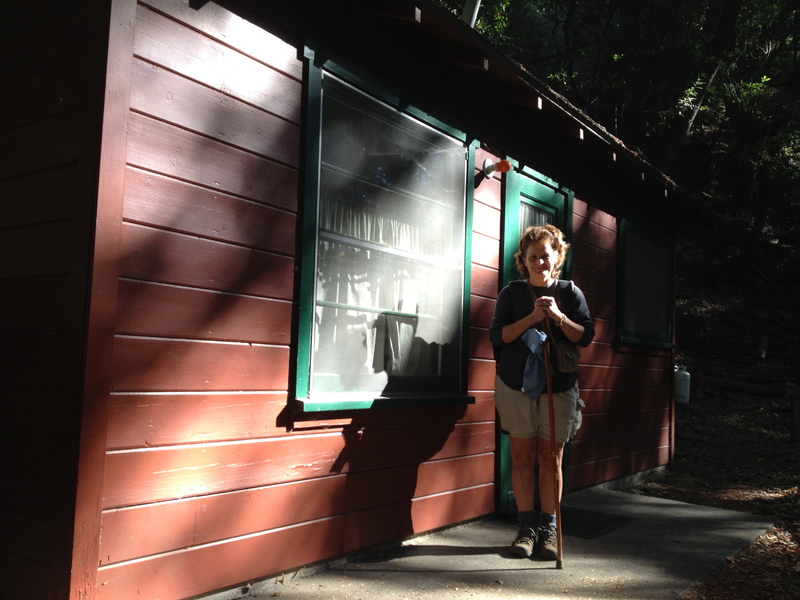 What follows are some photos of our cabin – and scenes from our hike back to Chantry Flat. 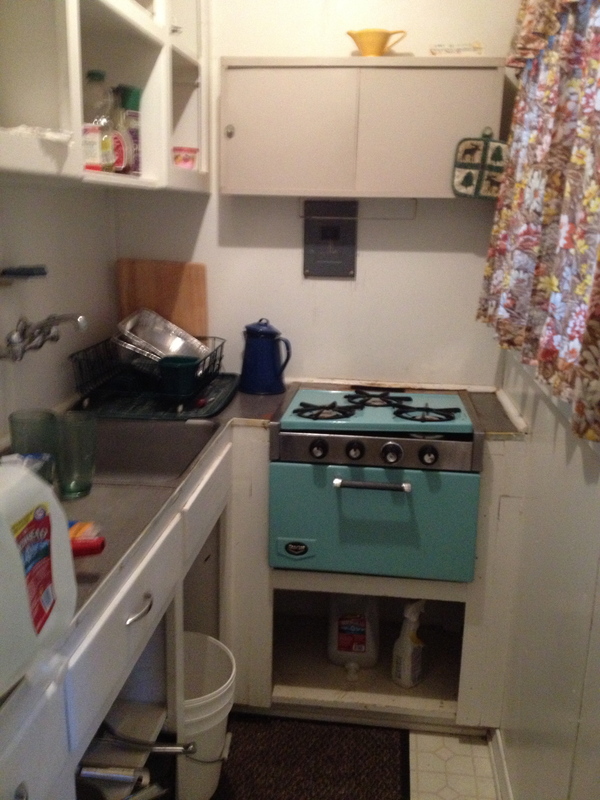 The kitchen in which we cooked chicken breasts for dinner. 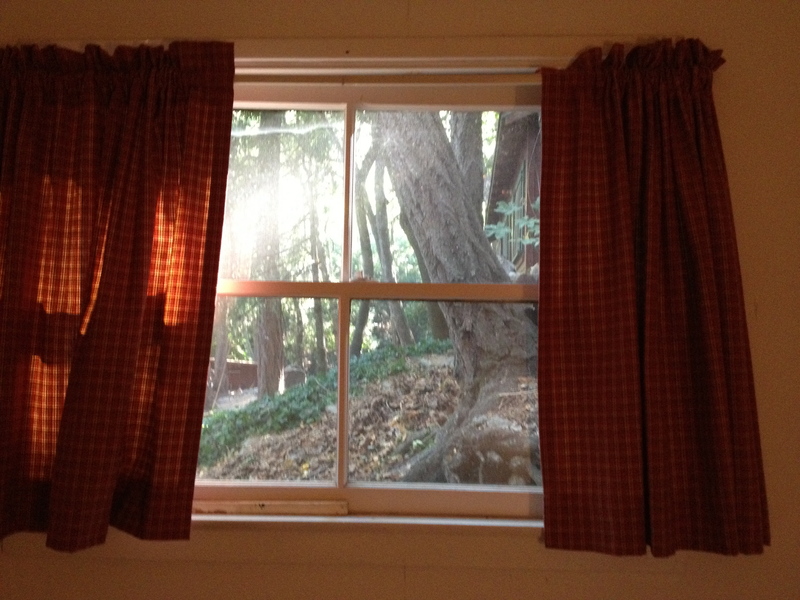 The pleasant sylvan view from our window. 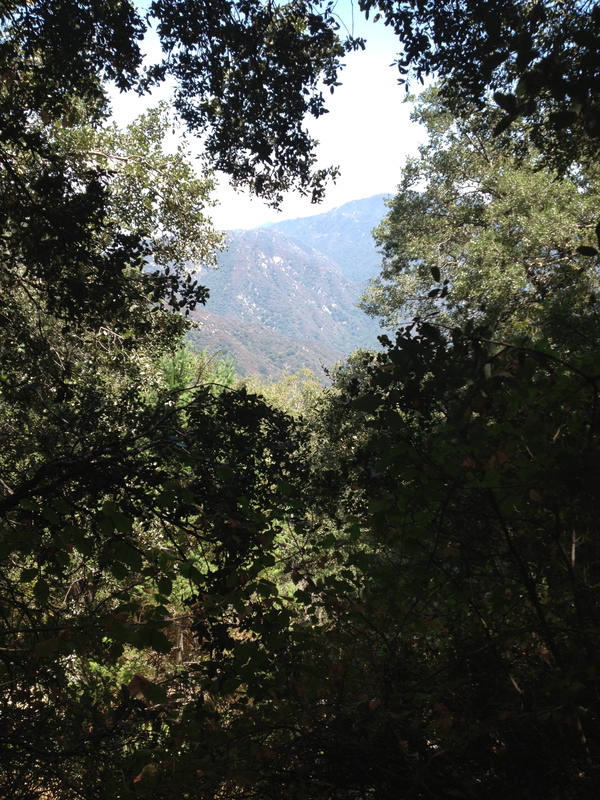 A view from the upper trail back to Chantry Flat. It’s scenes like these that keep us coming back to the mountains of Southern California. At a news conference held to make his case for the severity of the drought, Governor Brown used charts to show that this drought is historic — and that it’s time for Californians to conserve our precious water. But most of us Californians didn’t need Jerry Brown’s earnest show and tell to inform us that we’re going through a shockingly dry season. We have the clear evidence of our own experience. 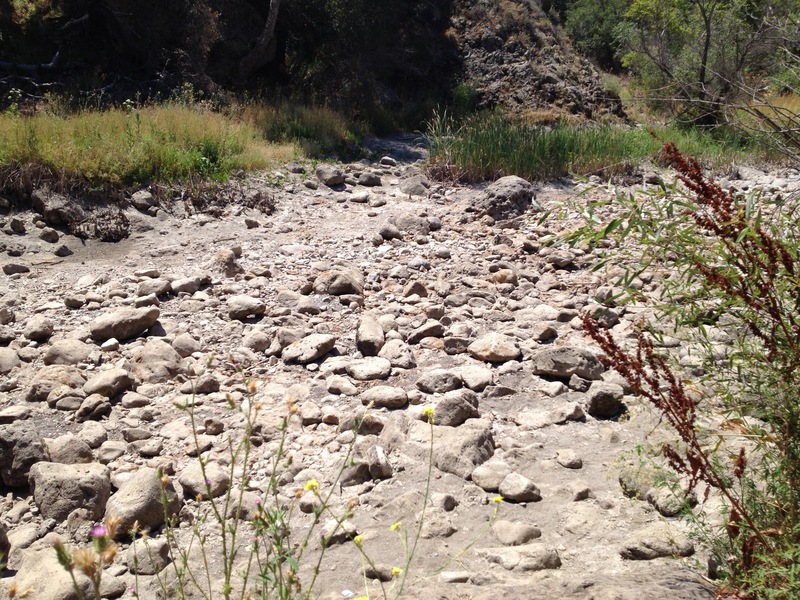 My wife and I took two hikes in the Los Angeles area this past weekend – and our state’s dire drought conditions were dramatically evident on both hikes. 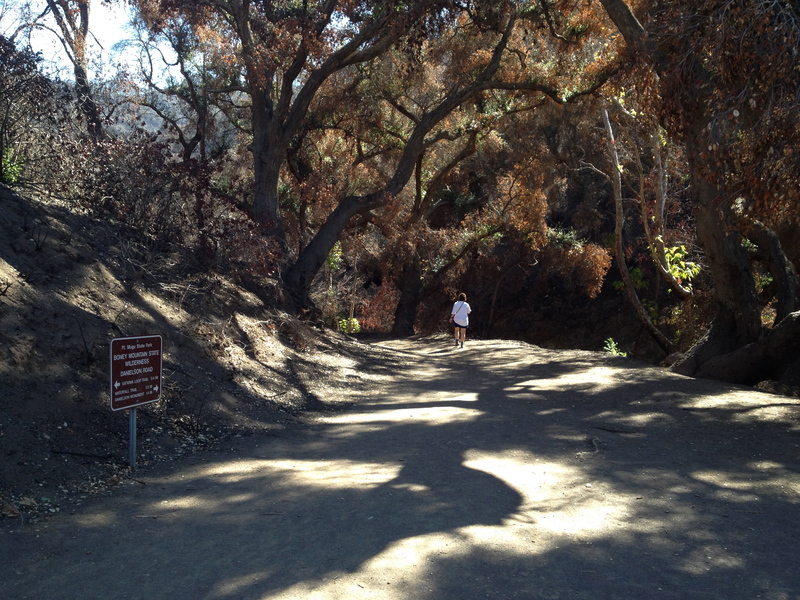 On Saturday we went, as we often do, to nearby Malibu Creek State Park. However, right now there’s no creek. 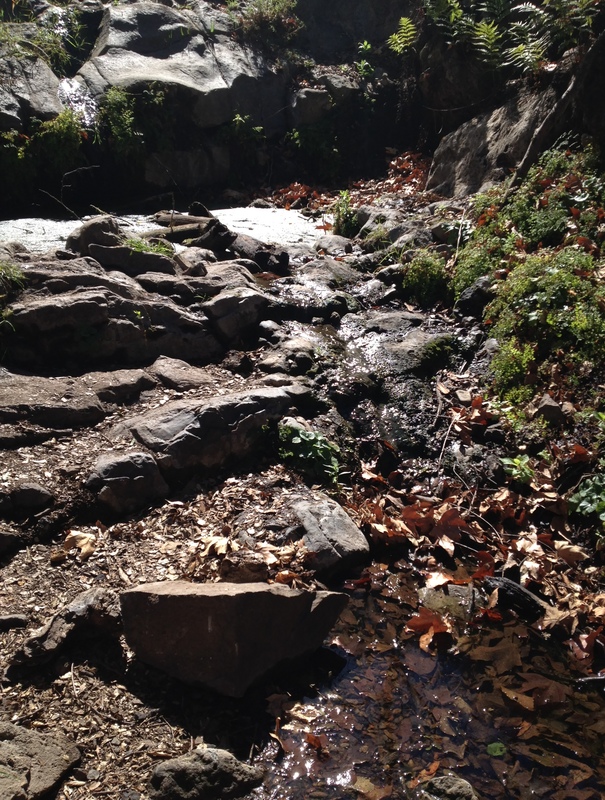 Here’s a photo of the creek from one of our hikes in the spring of last year. Here’s a photo of the creek as it appears now. All that’s missing is the creek. 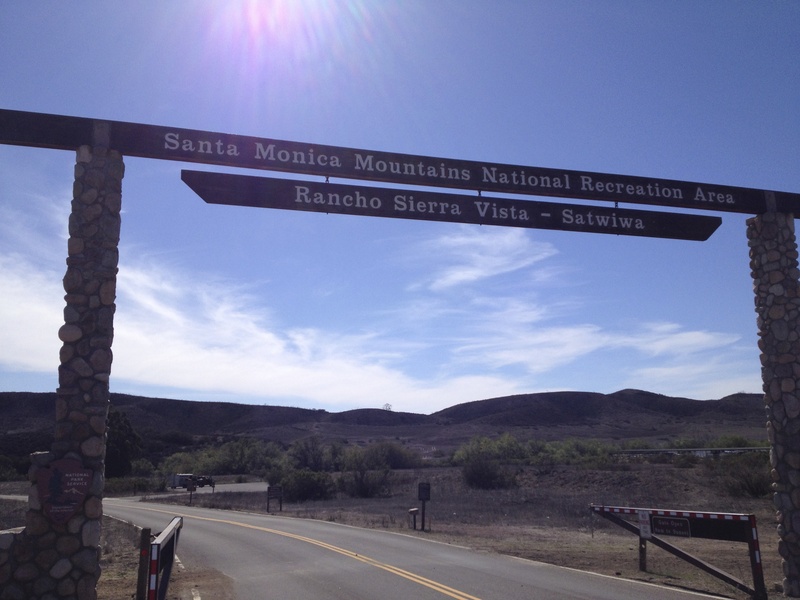 On Sunday, we took our second trip to The Santa Monica Mountains National Recreation Area, Rancho Sierra Vista – Satwiwa — just south of the 101 Freeway on the eastern edge of Ventura County. This wonderful park encompasses the area where the old Chumash Indian village Satwiwa once stood, as well as 8 miles of winding trail through Sycamore Canyon that the Chumash used as a path to the Pacific Ocean shore. 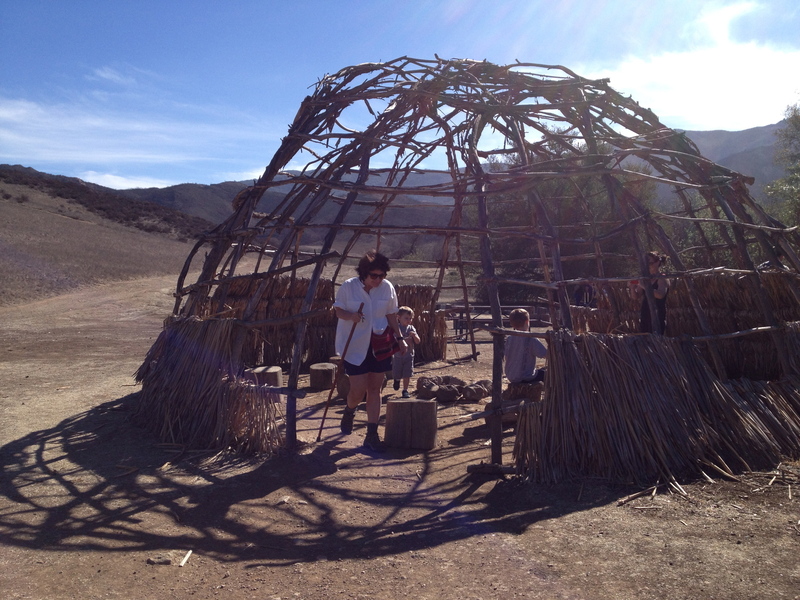 Victoria explores a Chumash dwelling at the Satwiwa Native American Indian Culture Center. 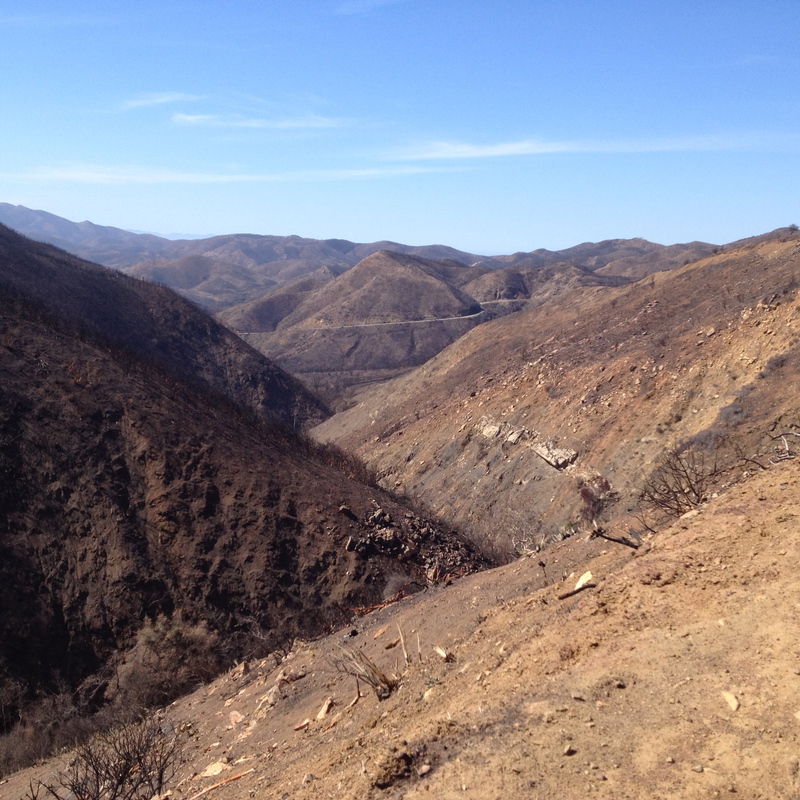 Last year, in May 2013, a wildfire raged across much of this parkland – and the devastation from that conflagration is evident in the charred, blackened landscape. Wildfires can happen in any season, in any year in Southern California, but drought conditions increase the danger of fire exponentially. 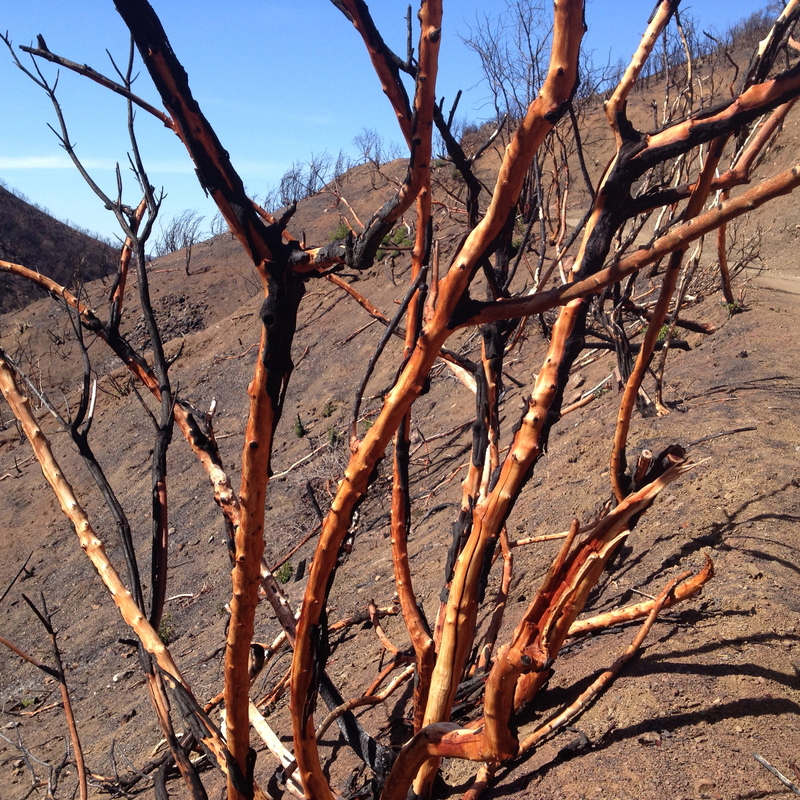 Fire is a natural part of the cycle of life in the Santa Monica Mountains. For ages, coastal Southern California chaparral land like that in the Santa Monicas has experienced infrequent but intense wild fires. 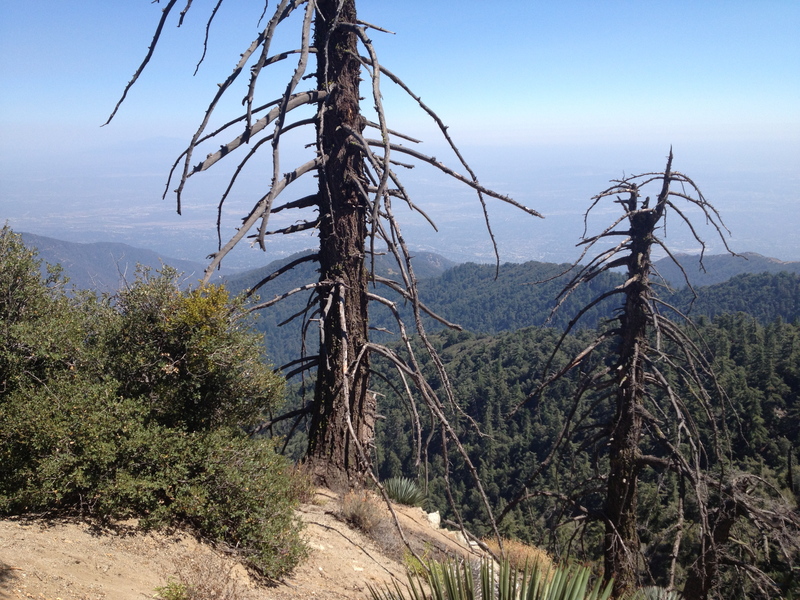 These fires usually blaze in the fall, driven by dry conditions and hot Santa Ana winds. Unfortunately, the frequency of fires has increased due to human activity. And the drought doesn’t help. 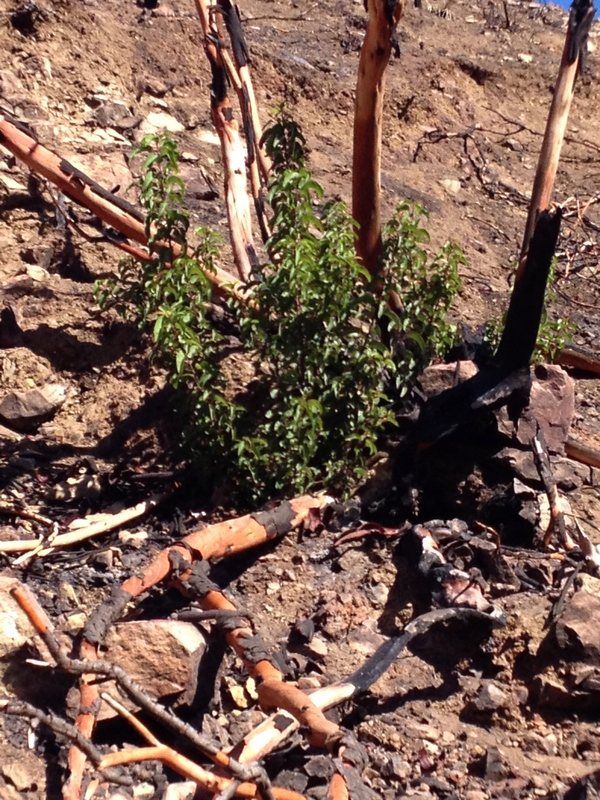 But, while the ravages of the fire can seem almost apocalyptic as you gaze in awe at the darkened, denuded hillsides – you can also see signs of bright green life creeping back into view. 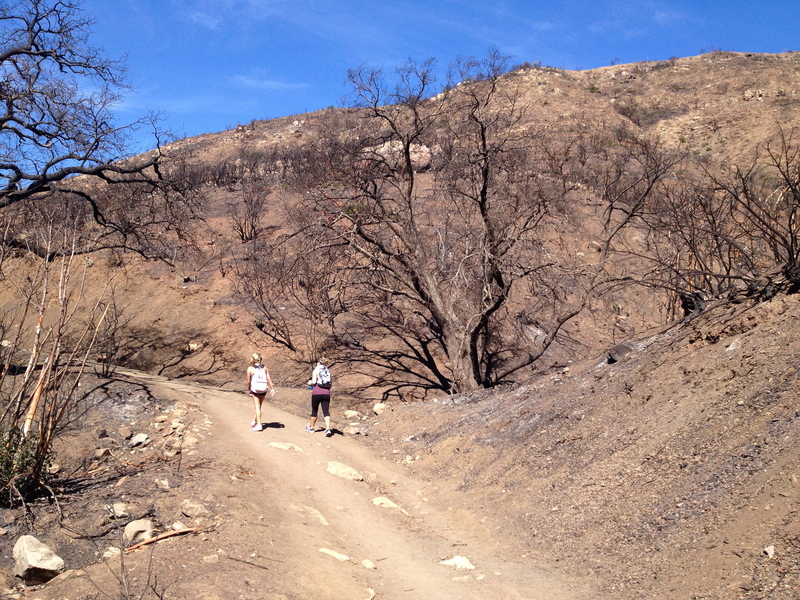 Within a few years, these hills surrounding Sycamore Canyon will be covered in greenery once again. Of course, a little rain would help that process of regeneration along. 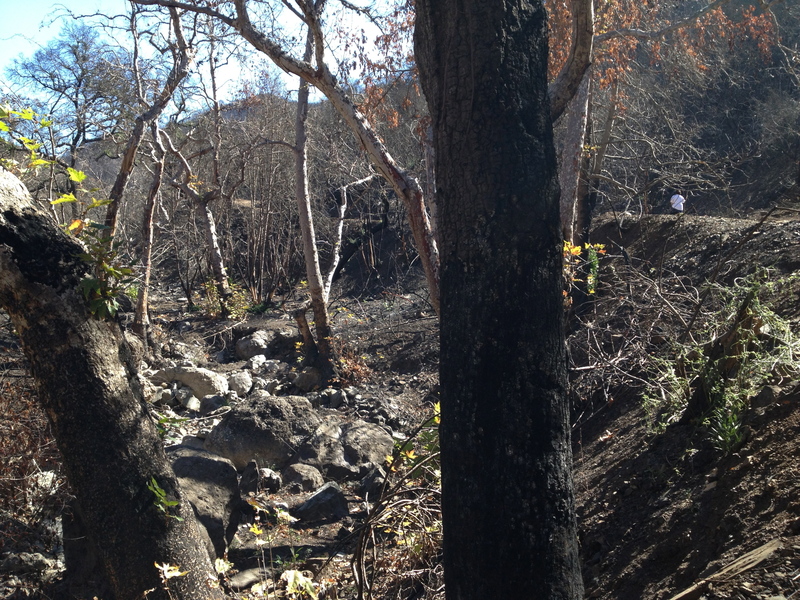 Here we are at the fire line: the place where the fire stopped. On one side, you can see Victoria walking under a canopy of live oaks: a sylvan heaven. 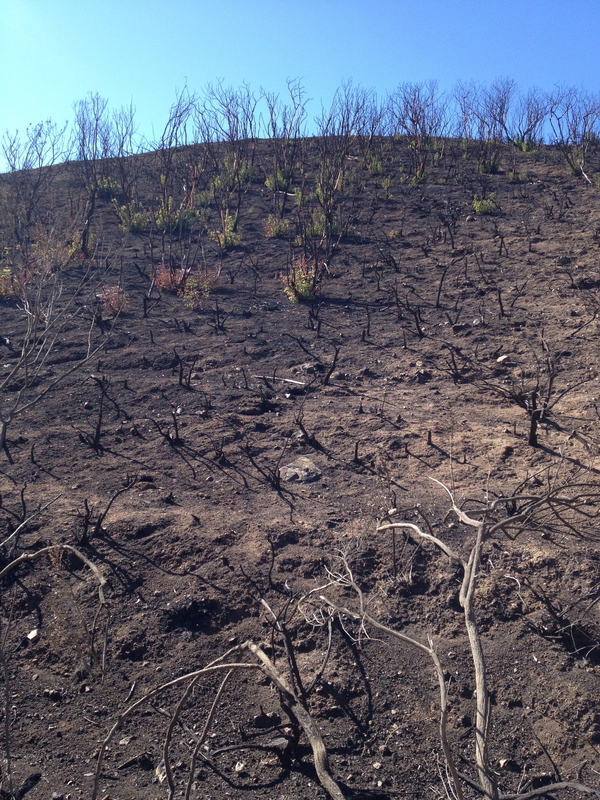 But when you turn around 180 degrees – there’s no canopy of trees anymore: just a charred hillside. Victoria and I hiked the trail that leads to what, in a normal, rainy winter, is a dramatic waterfall. 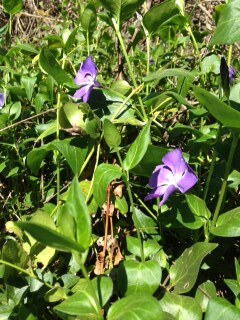 But our hike along the waterfall trail brought home the deadly dry nature of this year’s drought. 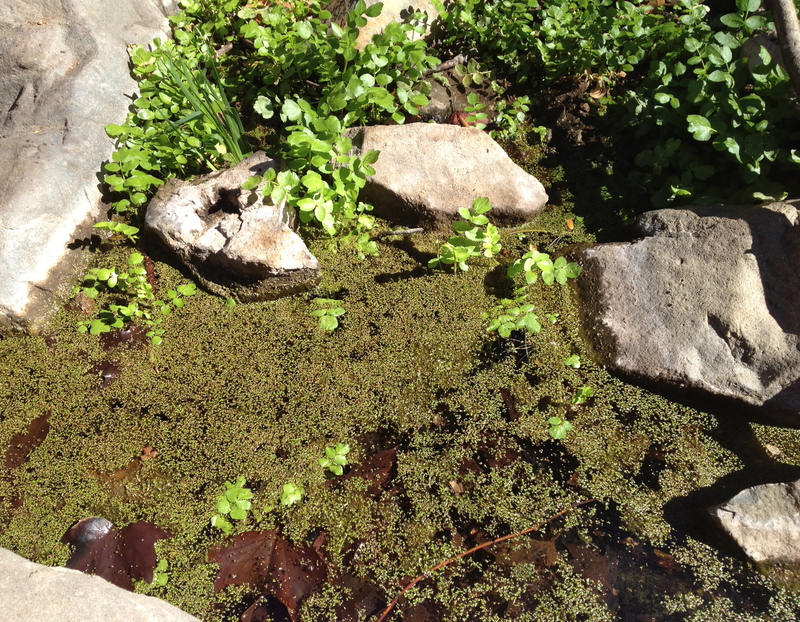 What follows are shots of the small pools of water that linger below the tiny trickle that, at this time of year, should be a dramatic cascade. 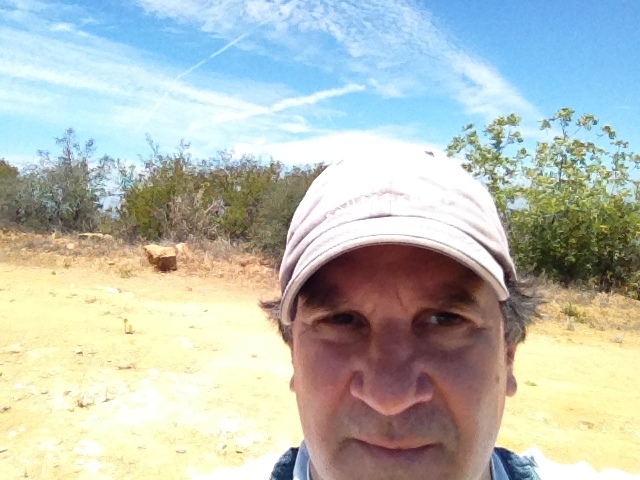 One of the great joys of life in Southern California – and especially here in Woodland Hills, situated in the foothills of the Santa Monica Mountains at the southwestern end of the San Fernando Valley — is our proximity to some of the best day hiking opportunities in the entire world. 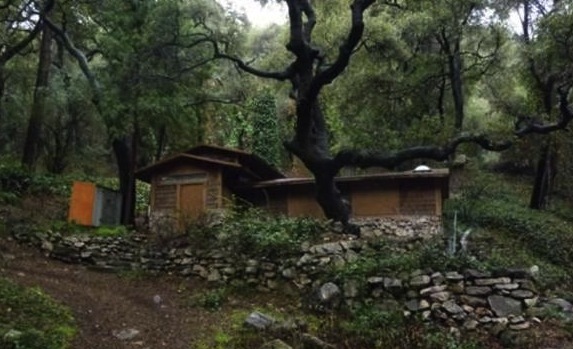 Where else could you leave your house, drive for 20 minutes – and wind up at a dusty trailhead that will soon take you up to a chaparral covered mountain ridge overlooking the Pacific Ocean to the south and, to the north, the entire San Fernando Valley, the Santa Susana Mountains and beyond. My hearty, vivacious wife Victoria and I have dedicated ourselves to hiking every weekend that we possibly can – and we were delighted to make our first ascent of the Backbone Trail late last year. 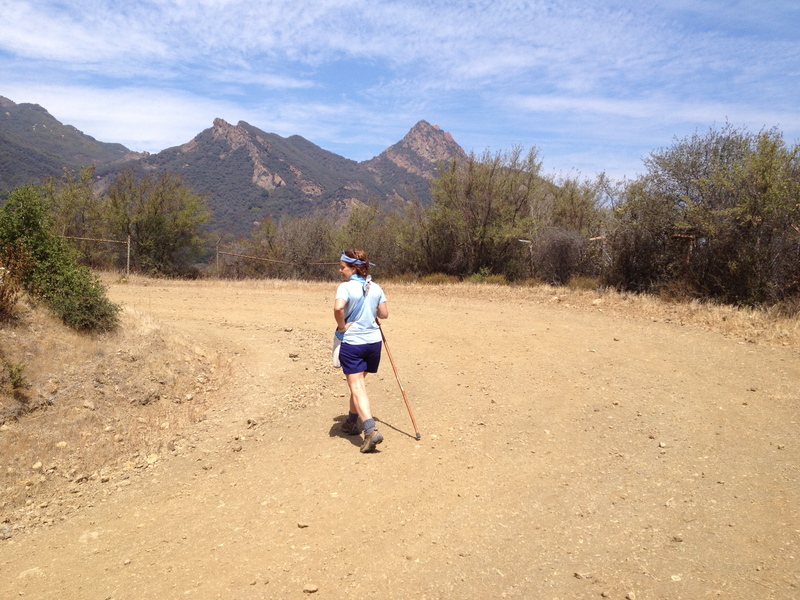 We returned to the Backbone Trail after the New Year with our daughter Emilia. We’ll be returning throughout 2014 to hike as many miles of this wonderful trail as our legs and lungs will allow. 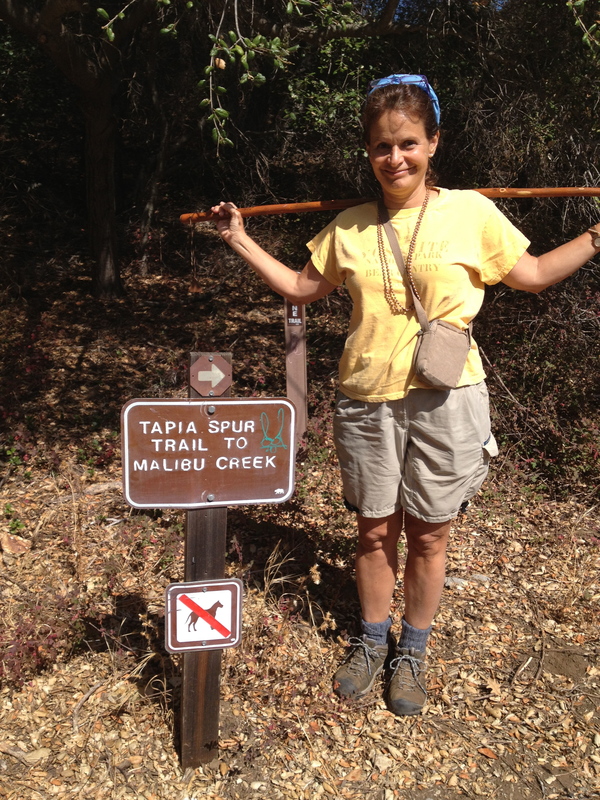 You can access the Backbone Trail from Malibu Creek State Park and several other locations along Pacific Coast Highway – but Victoria and I made our first ascent from the trailhead at Tapia Park off Las Virgenes Road. 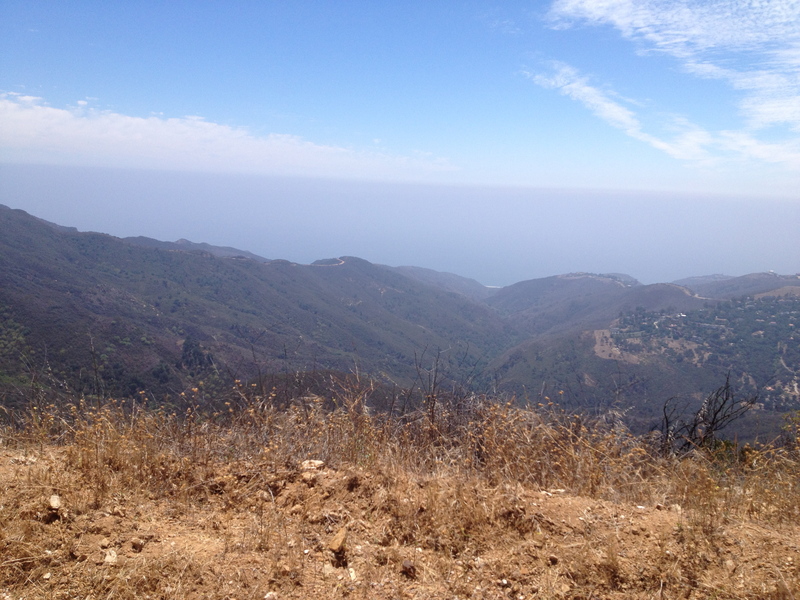 We started our trek with a daunting uphill slog – but the payoff was well worth the effort: the brilliant Pacific Ocean to our left and the familiar but still impressive San Fernando Valley and beyond to our right. It was exhilarating to walk a path astride the western edge of the North American continent. 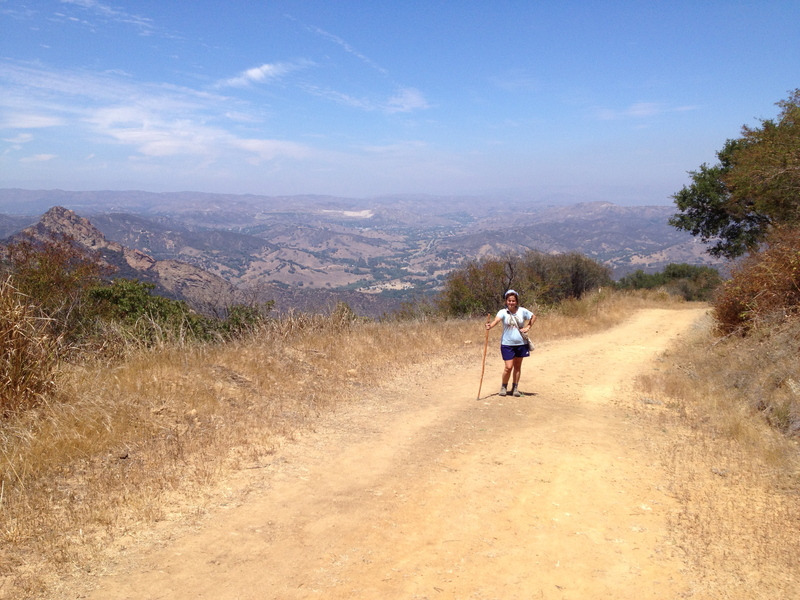 The Backbone Trail is considered the holy grail of trails in the Santa Monica Mountains – and Victoria and I wholeheartedly concur. 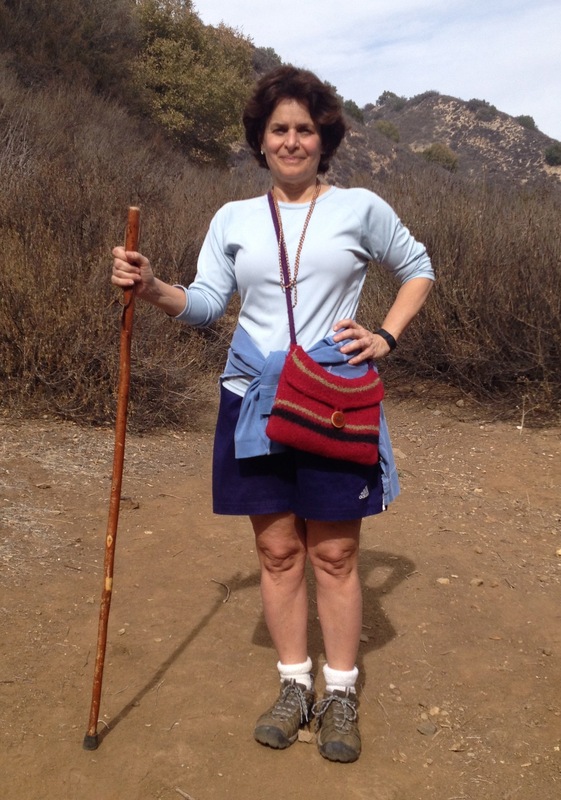 Vic and I have hiked Topanga State Park, Malibu Creek State Park, Solstice Canyon, the Hollyridge Trail and others in the Santa Monicas – but, while each of those hikes have a great deal to recommend them, the view from the Backbone Trail is unique, stunning and thought-provoking. 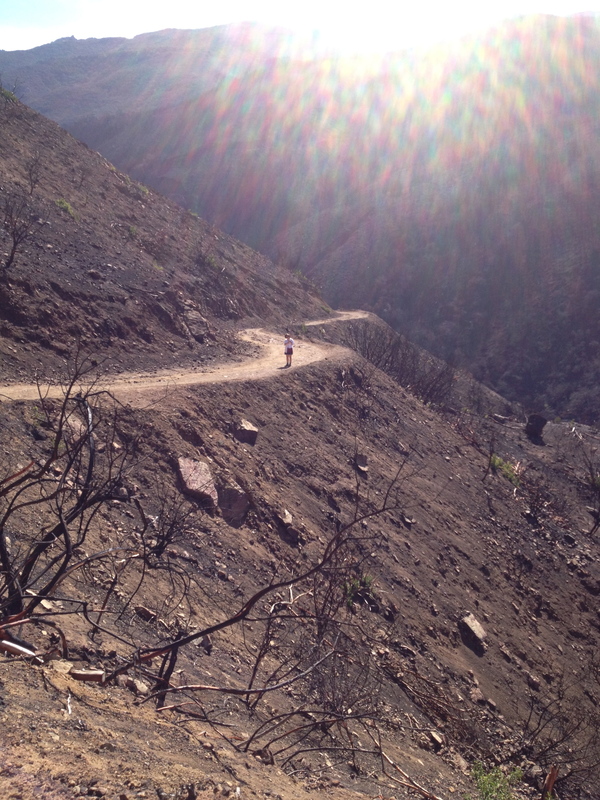 So, jump in your car and head to Malibu this weekend to ascend the Backbone Trail. And, as you enjoy the incredible views on both sides of the mountain ridge, when you encounter other hearty hikers along the way – tell them Vic and Paul sent you. They won’t have any idea what you’re talking about, but you may spark a conversation. 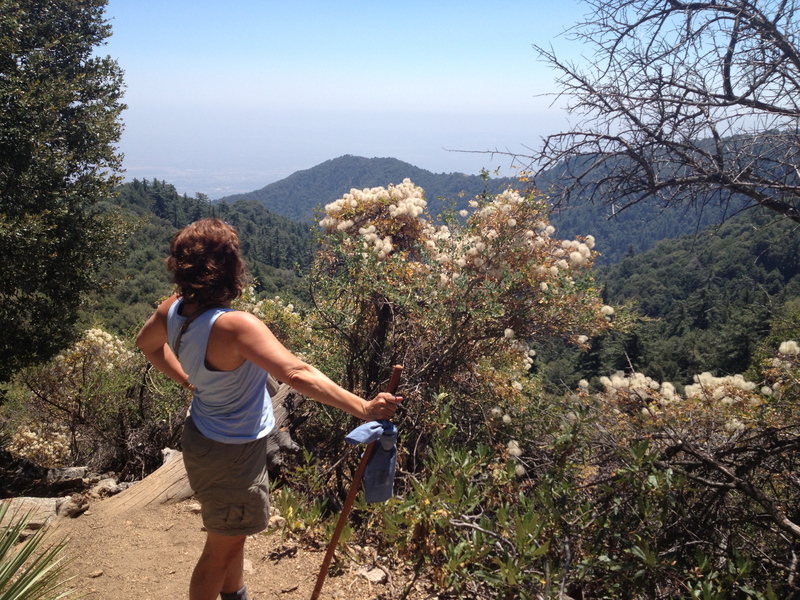 And our conversations with hikers on the Backbone Trail have all been interesting and inspirational. 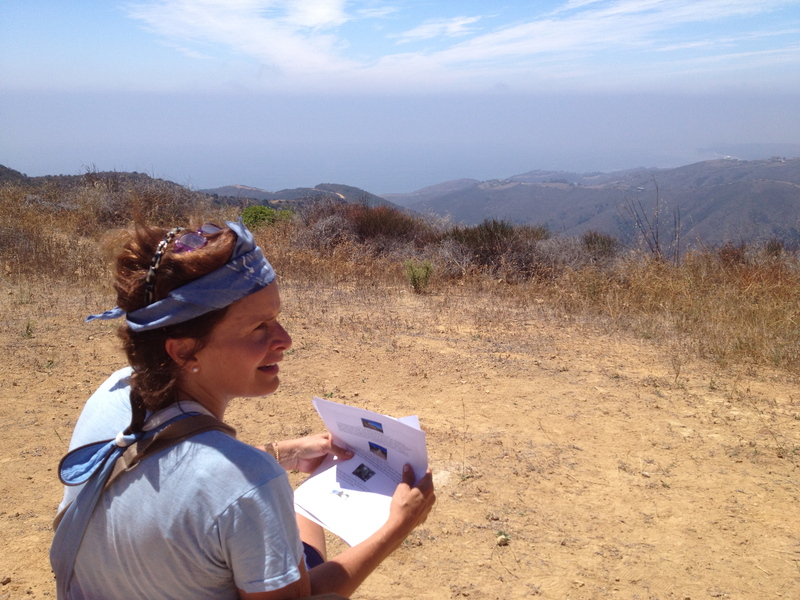 After all, everyone we talked to on the Backbone Trail had the good sense, creativity and imagination to climb up to a path from which they could gaze upon the expanse of the Pacific Ocean on one side — and the magnificent San Fernando, Simi and Antelope Valleys on the other side. I just love living in this corner of Southern California. One of the glories of life in Southern California is the ability to quickly escape to the wilderness – whether it’s the ocean, the desert, or the mountains. From our home at the southwestern end of the San Fernando Valley, we can reach the beach in less than a half hour, the high desert in a little more than that. 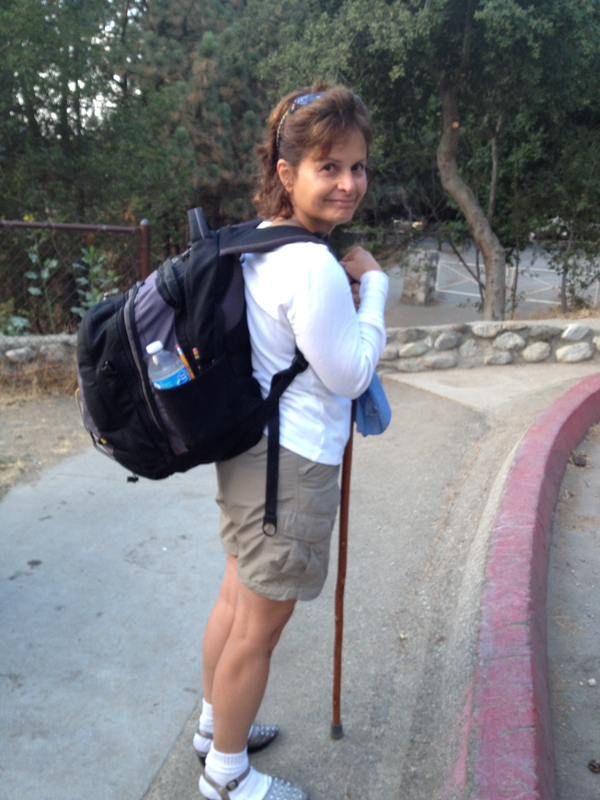 And in about fifteen minutes, my family and I can be exploring the Santa Monica Mountains at Malibu Creek State Park. 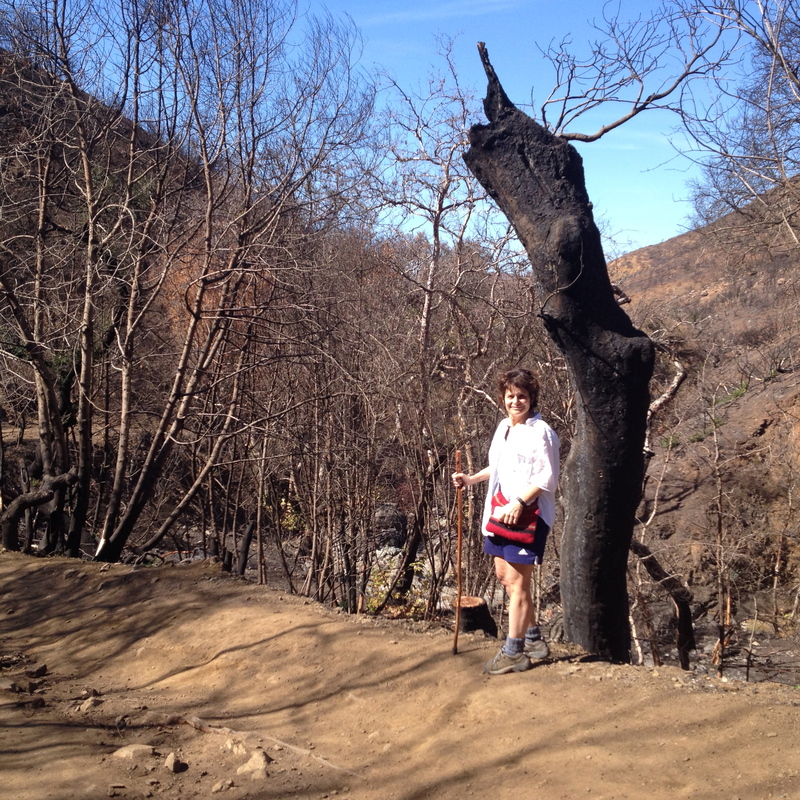 We’ve been coming to Malibu Creek since we moved to Woodland Hills twenty years ago. We go several times a year, and we’ve enjoyed it in all seasons. 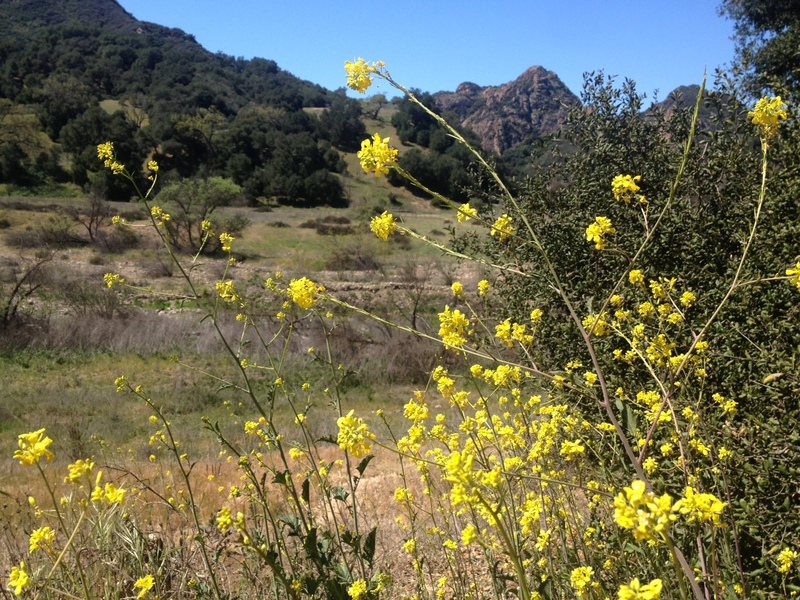 Each season has its own beauty — but of all the seasons, Malibu Creek shows itself best in the spring. 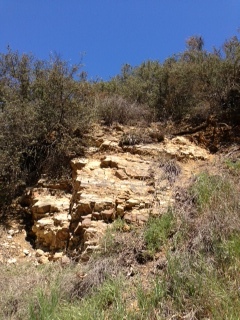 Located just south of the junction of Las Virgenes Road and Mulholland Highway, the place is a nearby paradise. After you paid the $12 vehicle fee and parked the car — within minutes you can hike to vistas where it’s impossible to tell whether you’re anywhere near civilization. You can almost imagine what the Chumash saw when they settled among these live oaks and sycamores 5,000 to 10,000 years ago. When we first brought our daughters to Malibu Creek State Park, the length of our family hikes were largely determined by our little girls’ enthusiasm for the expedition. We had to carry them along the trail sometimes, but eventually they became just as excited as their parents about spending some quality time at Malibu Creek. 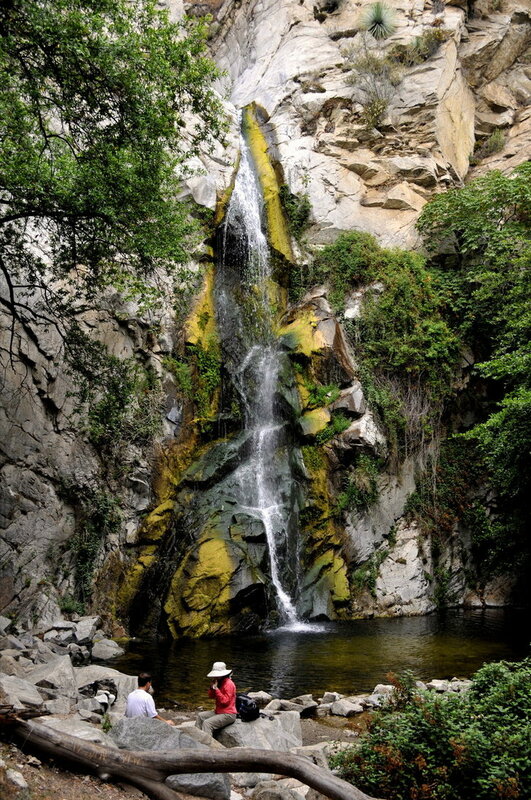 The chaparral-covered mountains that dominate the park are green in the spring and golden by fall – and have been coveted by Hollywood for decades: 4,000 acres of beautiful scenery within an hour of downtown Los Angeles. They’ve been shooting movies at Malibu Creek since the silent film era — and in 1946, 20th Century Fox bought 2,000 acres of what’s now the park to shoot movies like How Green Was My Valley, Love Me Tender, Viva Zapata, and Planet of the Apes. But the production for which the park is most famous was shot for the small screen. 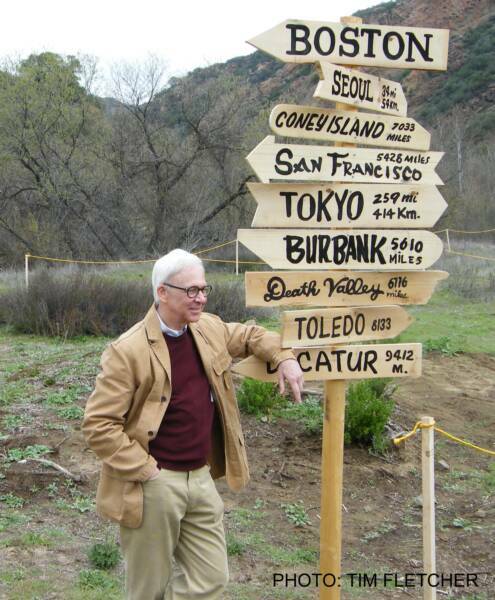 And that is why, the Barrosse family sets off along the trail to the M*A*S*H site: where from 1972 to 1983, the Santa Monica Mountains stood in for Korea on the classic sitcom, starring Alan Alda. When the girls were young, a couple of rusting Army vehicles were all that indicated you’d reached your destination. Father Mulcahy at the reunion. But once you arrived at the M*A*S*H site, if of a certain age, you could easily recognize the jagged hills through which the helicopters passed and the plateau where they landed. You could even see the path that Captain Hawkeye Pierce climbed to meet the incoming wounded. 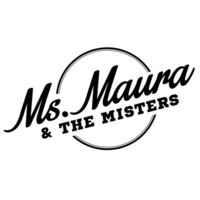 Since former cast and crew celebrated the 25th anniversary of the series’ last episode in 2008, the M*A*S*H site has gotten a facelift. 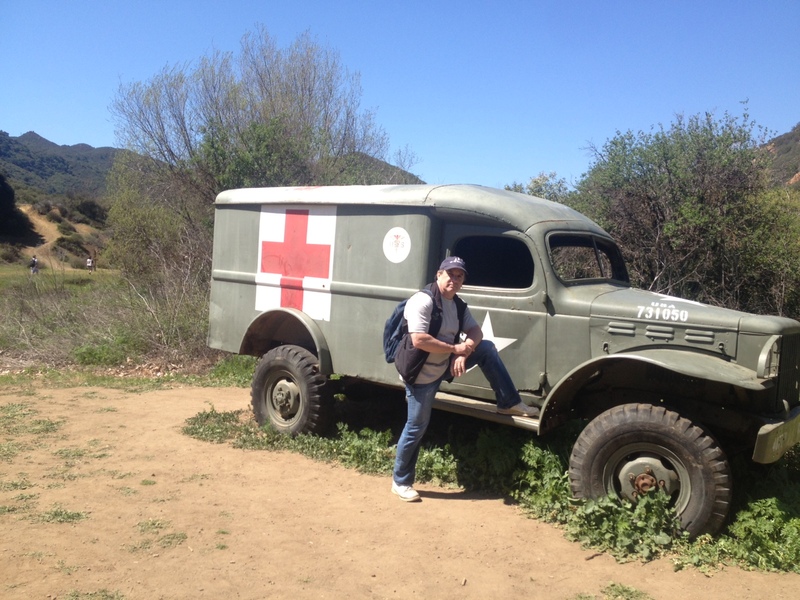 There are now signs that explain various features of the site, markers that lay out where the tents and buildings stood – and a freshly painted vintage ambulance offered up to the ravages of nature. 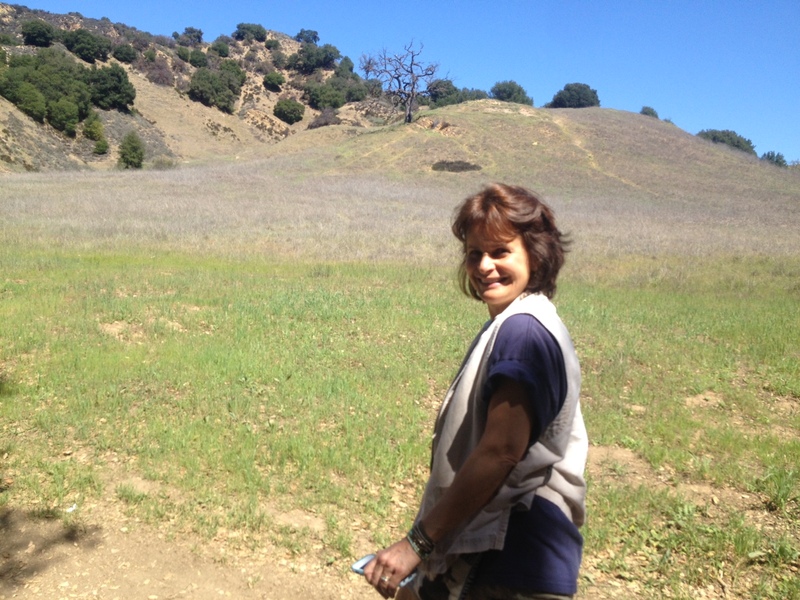 Along the trail to and from the M*A*S*H site, my wife Victoria, daughter and I were delighted to see the wildflowers starting to bloom. And we kept our eyes and ears alert for wildlife. 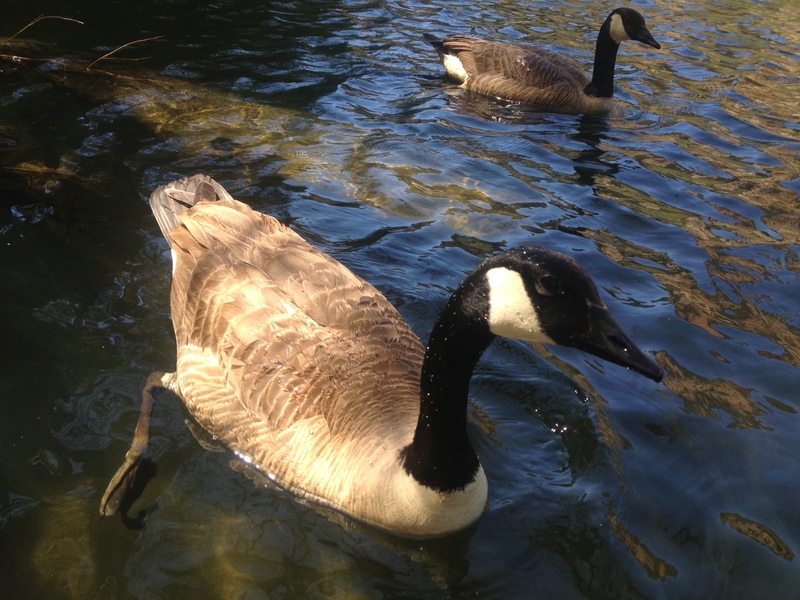 These geese weren’t that hard to track down. In fact, they just swam right up to Eva as though they were expecting her. 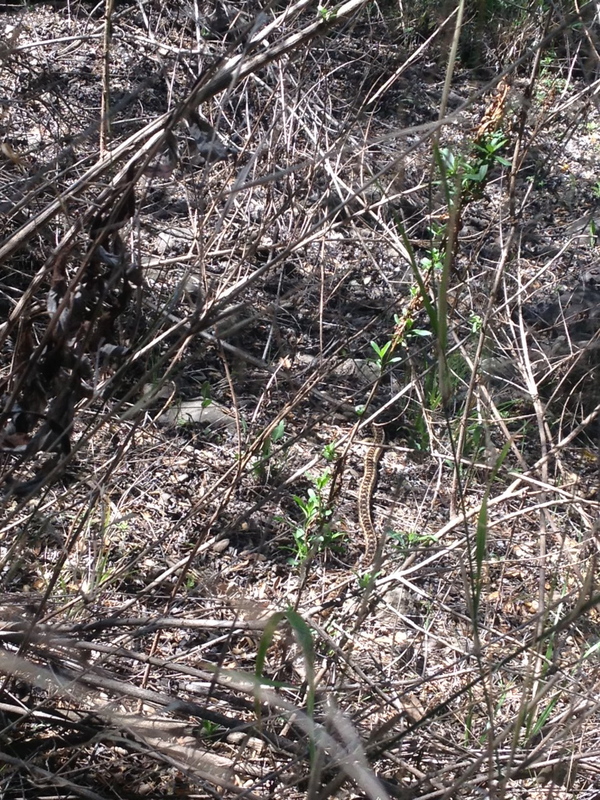 Can you see the well-camouflaged critter in the photo below? And do you know what this nasty-looking insect is? It’s a Jerusalem cricket. 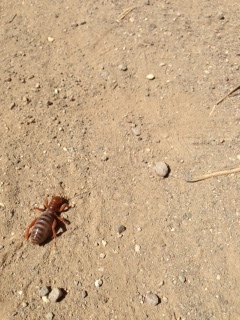 They’re not really crickets, and they’re not from the Holy Land, but you might find one at Malibu Creek State Park. Quick. Let’s have another pretty picture. 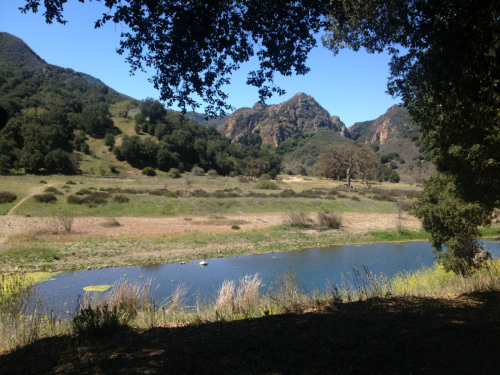 Malibu Creek State Park is a large slice of heaven waiting just next door. I’m already looking forward to my next visit.